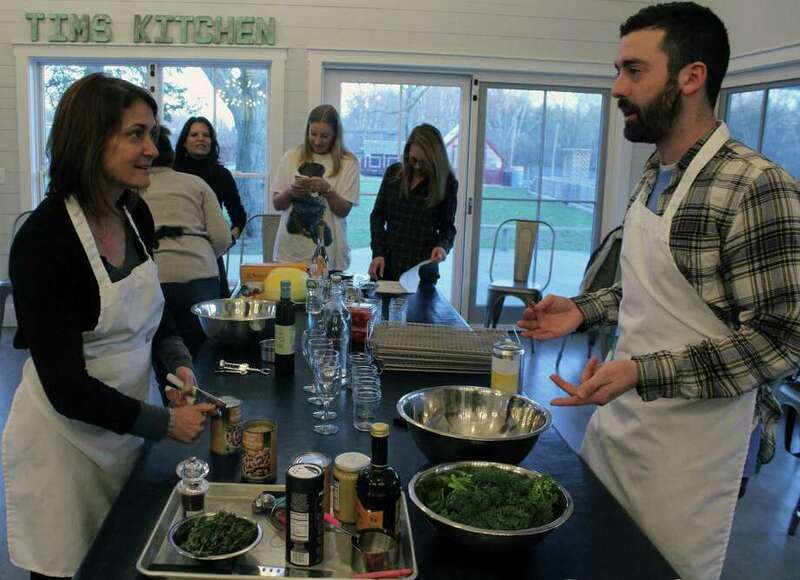 Hearst Connecticut reporter Justin Papp takes a cooking class at Wakeman Town Farm in Westport. My group members were Stacey Babson-Smith, of Weston — who used to cook often for her children, but does less now that they’ve left the house — and Gina Fedeli, of Orange, and Sue Redston, of Monroe — friends attending their second class at Wakeman who, to their dismay, left the bottle of wine they were to split on Gina’s counter. I introduced myself as a reporter, and by way of explaining the concept of my “That’s a First” column, alerted my group to my gastronomical shortcomings. Obviously, I’ve cooked before, but my repertoire is limited. I make myself scrambled eggs every morning, but lunch and dinner are usually ordered out or kept very simple — usually some combination of meat, rice and beans. I never follow a recipe, or push myself to make more adventurous meals. So I was intimidated by my group’s recipe: skirt steak and broccolini — like broccoli, I learned, but with longer stems and less leafy stuff up top — with white beans. Nevertheless, my group members were encouraging and seemed to warm to me quickly. The recipe had only three steps. The first was to whisk together the vinaigrette, with garlic, Dijon mustard, oregano, salt and pepper and oil and vinegar, in which the steak would marinate. The second was to lay out the broccolini and white beans on a sheet, over which the steak, on a cooking rack, would broil (third step). While Sue and Gina began the marinade and Stacey read out directions and gathered the necessary equipment, I availed myself of one of the two knives laid out for us and began chopping the garlic, figuring that it was a way to pitch in without jeopardizing the final product. “Maybe you should use a different knife,” Gina kindly suggested, noticing that I’d lost a clove over the table. I switched out my tool for the other at the table. “A sharper knife might work better,” Stacey opined, returning to the table with a bowl after I had already heeded Gina’s advice. Not knowing who or what to believe, I resumed chopping with the original knife. One member of the Wakeman staff walked over and complimented me on my work. I was flattered, though I wondered if she would’ve praised any of the other class members for their mastery of such a simple skill. With the approval of the group and help measuring from Sue, I added the fine bits of garlic to the marinade and, feeling confident that I’d found my niche in the kitchen, began hacking at six ounces of oregano. After about 15 minutes, our steak had marinated, our broccolini and white beans had been laid out and we made our way from the two long tables set up in the middle of the room to the front of the kitchen, where we waited for the ovens to free up. Members of other groups finished their broiled halibut with fennel and orange, fish tacos and spaghetti squash puttanesca, respectively. One by one, the dishes came out and Stacey, Sue, Gina and I took our seats to test out the various recipes and chat. We spoke about their kids, work, Sue and Gina’s upcoming trip to Iceland and Stacey’s past trip “glamping” (glamorous camping) on safari in Botswana. I expressed to them my insecurity at having done only the most menial cooking tasks. “If you were at my house, I’d be happy to have you take the role of sous chef,“ Gina assured me.